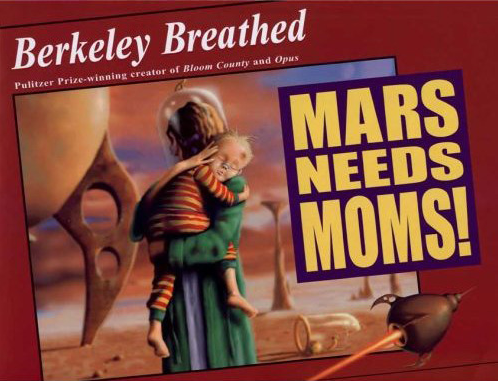 In honor of Mother’s Day this past Sunday, first graders heard Mars Needs Moms by Berkeley Breathed. As usual, Mr. Breathed’s illustrations are absolutely captivating and the story matches their superlative level. As little Milo chafes at his mother’s restrictions (what? tinting your little sister isn’t okay?) he gets sent to bed and falls to sleep, waking up as his mother is spirited out of the house by Martian aliens. Jumping on the spaceship in order to save her, she ends us saving him and in he sees just how much value moms have. This is a touching story that literally keeps little one spellbound and speechless (no small feat) and I must say I have to try hard to finish reading aloud over the little lump in my throat at the end. Of course, I am a mom…..
Kindergarten–In a comical sequel to Muncha, Muncha, Muncha, Candace Fleming brings back those adorable bunnies and the irascible Mr. McGreeley in Tippy, Tippy, Tippy, Hide. This time those bunnies are trying to get into the house for the winter and after Mr. McGreely “bunny proofs” his house, he realizes he’s trapped inside and can’t get out for spring! Bunnies to the rescue again, of course. As well as being a delightful story, this book is a great way to introduce prepositions. Second Grade–Alphabet soup does strange things to Martha, the dog, in Susan Meddaugh’s book Martha Speaks. But having a talking dog becomes a bit of a problem for the family as Martha just doesn’t know when to stop. Martha saves the day, however, by dialing 911 when a burglar hits the house and becomes the family hero. Third Grade–And the princess kissed the frog, he turned into a prince, and they lived happily ever after. Or did they? That’s the hilarious premise of Jon Sciezka’s The Frog Prince Continued and third graders enjoyed seeing what happened. Too many lily pads, hopping on the furniture, and croaking snores sends the prince out in search of a witch who can turn him back into that frog. After mishaps with some famous witches, the prince returns to his worried princess, gives her a kiss and…..well, you have to read the book. This is right up the alley of a third grader’s sense of humor! Fourth Grade–Another great book by Jon Sciezka was fun for fourth graders to hear and really exercised their “thinking caps” as we read Math Curse. It starts out with the teacher, Mrs. Fibonacci, saying that “you can look at everything as a math problem,” and our narrator goes through a day filled with one problem after the other. What a great way to show students that math is a part of their every day lives in countless ways and the ending math problem/riddle delights them! Fifth Grade–Finding information using Google can be a daunting task. This week I showed fifth graders one more way to narrow their searches. Wonder Wheel is a Google feature that creates a graphical organizer of possible sub-subjects for searches. After I demonstrated how it works, students worked on a project to find information about five different topics and by using Wonder Wheel and the limiter, site:edu, they were amazed at how specific their searches became and how easy it was to find the information asked for in the assignment. Sixth Grade–This week sixth graders made practice bibliographies using a book, a print encyclopedia article, and a website. Tedious work but worth knowing how to do, even in this age of automatic bibliography makers. It was important for them to learn how to find the various bits of information needed in a bibliographic citation so that if they do choose to use a bibliography maker, they will get the correct information to insert and will know how to format a bibliography correctly.